Jet Setters Dimensional Stickers - REMINISCE-Jet Setters: Die-Cut Stickers. Whether you are scrapping your vacation or just celebrating your home state, these layered dimensional stickers will add the perfect amount of pizzazz! They are available for each of the fifty US states and Washington DC so no matter where you travel or live there is a set for you. (each state sold separately). 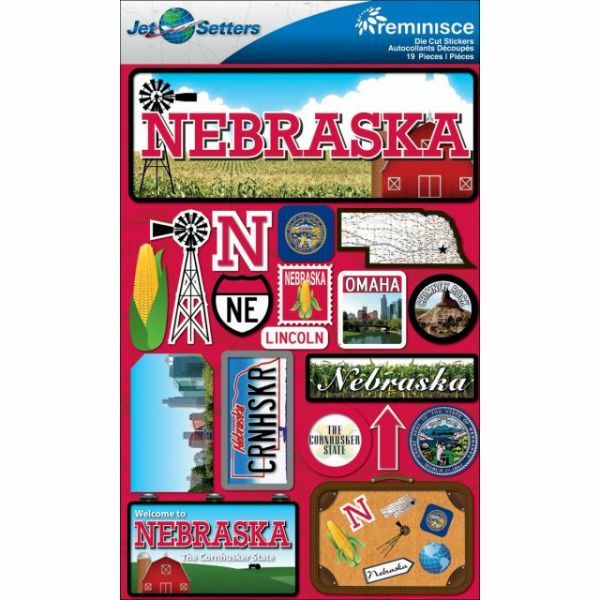 Each package contains one 7-1/2x4-1/2 inch sheet with an assortment of die-cut stickers featuring some of the most-well known and best-loved elements of the state. Number of stickers per package varies by state. Imported.